Apple and its partner wireless carriers on Friday initiated preorders for the latest iPhone 6 and iPhone 6 Plus handsets, though the purchase process was a harrowing experience for customers who saw persistent issues with the Online Apple Store. Cellular providers were first to have Apple's new iPhones up for order on their respective websites just after midnight Pacific time, but the Online Apple Store saw massive delays, likely due to overwhelming demand. At the time of this writing, the Web version of Apple's store is still down for many customers in the U.S., though some have reported luck purchasing through the iOS app. The solution is not foolproof, however, as many users are seeing error messages seemingly indicative of syncing issues with wireless providers' sales and upgrade eligibility systems. Noticeably absent from the initial preorder round was T-Mobile, the only U.S. carrier to offer off-contract handsets at launch. All other carriers were showing full availability with arrival dates of Sept. 19. On-contract pricing for the 4.7-inch iPhone 6 starts at $199 for 16GB, then moves to $299 for the 64GB version and maxes out at $399 for 128GB. 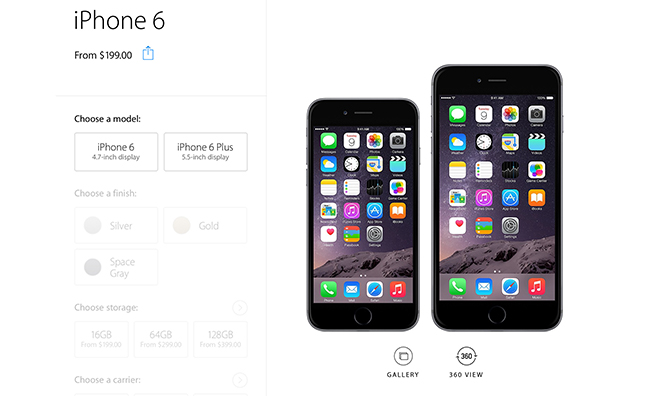 The iPhone 6 Plus is also available in 16GB, 64GB and 128GB capacities for $299, $399 and $499, respectively. When available, the contract-free T-Mobile version will start at $749 for the iPhone 6 and $849 for the iPhone 6 Plus, moving up in $100 increments depending on storage. Apple is launching the iPhone 6 and 6 Plus in nine countries, including Australia, Canada, France, Germany, Hong Kong, Japan, Puerto Rico, Singapore, U.S. and the UK. 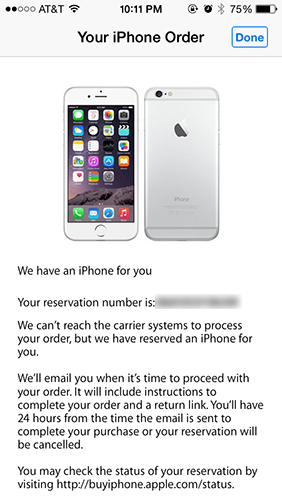 Alternatively, customers can purchase the iPhone at Apple Stores on Sept. 19. Those looking to trade in their old hardware to offset the cost of a new handset can visit AppleInsider's Trade-In Price Guide for the latest deals. Update: Due to server communication issues with certain cellular providers like AT&T, Apple has resorted to reserving iPhone 6 handsets for later processing. In addition, those able to get through via the iOS App Store app are reporting iPhone 6 Plus stock outs for launch day units. Update 2: The Online Apple Store returned to service at around 2:45 a.m. Pacific, nearly three hours after partner carriers began accepting preorders. The store is reflecting low supply of iPhone 6 Plus units, with most 16GB models shipping in 7 to 10 days, while 64GB and 128GB versions are showing 3 to 4 weeks ship-by dates. iPhone 6 stock appears to be holding steady at this time. Also available are off-contract iPhone 6 and 6 Plus handsets from T-Mobile, which were previously absent from the Apple Store app when preorders went live at midnight.